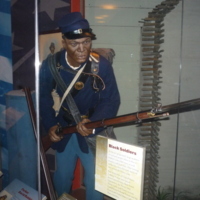 This mannequin presents a powerful image to the visitor who might expect interpretive efforts to be entirely focused on the Civil War as experienced by white Southerners. This case does represent, however, only a portion of the comprehensive black experience during the Civil War. Though millions of slaves were not allowed, were not able, or did not choose to fight as Union soldiers, their story is muted here. Though â€œThe Story of the North Carolinaâ€ frames provocative discussions of slavery and race relations before and after the war, â€œNorth Carolina in Crisisâ€ remains isolated from these discussions and focuses on African American agency insofar as it relates to military combat. Michael Moore, Exhibit case in "North Carolina in Crisis," personal photograph by author, Raleigh, NC. Moore, Michael, Michael Moore, Exhibit case in "North Carolina in Crisis," 2013, Civil War Era NC, accessed April 24, 2019, https://cwnc.omeka.chass.ncsu.edu/items/show/762.